Haru and Shizuku may have had their happy ending, but their story and the stories of their friends and family are far from over. Sasayan and Natsume’s relationship, the inner workings of Iyo and Yuzan’s behavioral motivations, and even Takaya’s high school life are all stories that remain to be told. And, of course, we can hardly forget Haru and Shizuku’s big wedding day. Although My Little Monster technically ended with the conclusion of the twelfth volume, author Robico continued to release epilogue-style chapters for a period of time afterwards, all of which were compiled into this final extra-long volume. Thankfully, Kodansha Comics USA decided to translate and bring this extra volume westward. Although I said previously that My Little Monster had an excellent concluding volume that wrapped everything up quite nicely, this additional volume somehow manages to add extensively to what was already a stellar ending to an amazing series. There are four primary chapters in this volume (with tons of bonus shorts and extras as well), and the first of these focuses on how Sasayan’s feelings for Natsume developed over time. In the primary story of My Little Monster, most of the details surrounding Sasayan were often left to the readers to assume to a certain extent. However, this Sasayan-centric chapter actually helped not only to explicate his actions but also to further flesh him out as a character, and it does this quite effectively. Sasayan’s outgoing personality often makes him appear more carefree than others, and while that isn’t necessarily entirely false, it is definitely not something that always holds true for him. His background as the youngest of four rowdy brothers and the relationships he has had with past friends are all far too complicated to make his life that simple, and that was why this chapter served excellently to advance his character. Additionally, since the chapter flits throughout high school to show Sasayan’s progressive feelings towards Natsume, the entire timeline of their high school relationship is mapped out and makes for an excellent start to the volume. It’s funny that I say that the excellent first chapter of this volume was arguably just a taste of what was to come, and is quite telling of the quality of the rest of the book. The second chapter focuses primarily on Yamaken’s sister Iyo, who was a slightly late addition to the main cast and thus didn’t get the same level of time devoted to her in the main story as others. Fortunately, this too is rectified in this chapter as the reasons behind her behavior are explored. As the younger sister of Yamaken, Iyo has always felt a bit ignored, and thus longs for a spectacular romance. Her slightly erratic behavior leads to some entertaining scenarios, including a date with Haru’s brother Yuzan. Because of her direct connection with Yamaken, he gets a bit of time to shine in this chapter as well, which makes overall for a quality addition to the story. The third portion of the book shifts focus entirely to Yuzan and the developments he makes following the conclusion of the main story. Yuzan’s relationship with Haru had been a very important and high quality portion of the main story, but even more of Yuzan’s perspective is offered for us in this chapter as we see how he went from the character in the main story to the politician depicted in the final pages of the twelfth volume. Yuzan’s desire for his uninterested mother to pay attention to him and for his father to care for him led him to put substantial effort into his behavior, but also pushed the divide between him and Haru as his jealousy of Haru’s talent grew. The further exploration and extra details of Yuzan’s past was a nice addition to what was already a very solid character. Additionally, towards the end of this chapter, Yuzan has a very emotional conversation with Shizuku’s younger brother Takaya of all people and makes another key realization about his relationship with Haru. I particularly enjoyed this chapter for this final scene, as it was one of the more impactful moments in the entire series even though it had little to do with the primary pairing. However, the final main chapter flashes forward a few years and shifts focus to Takaya during a special period: Haru and Shizuku’s wedding. This final chapter is actually likely my absolute favorite chapter in the entire series (which is saying something) because of how much it does. First off, Takaya, a previously minor character, gets his time to shine now as an older high schooler. Ever since he was younger, he’s had a crush on Shizuku and Haru’s friend Oshima, and the beginning of the chapter traces his time in high school when she was a student teacher up until the present, when he finally decides to confess his feelings for her. The relationship between Oshima and Takaya was particularly effective for me because of how it continued to explore Oshima and especially Takaya’s characters. Seeing how Takaya aged into the quiet but forward teenager was very enjoyable. The actual wedding of Shizuku and Haru was a very emotional moment and an excellent service for the fans as the rare opportunity to see the pair we’ve followed for so long tie the knot, so to speak. The entire section basically just gave me an intense feeling of satisfaction as it was very well done and provided the unique detailed opportunity to witness the moment of the wedding. In addition to the four main chapters, numerous extras are included, including short comedy strips and character description pages. Kodansha Comics USA actually added portions of the My Little Monster Fanbook to this volume, which was a very special bonus for fans that I greatly appreciated. There are short stories such as Haru’s day off from school and the time Yamaken met the three Kaimei students included, all of which are humorous additions to what was already a supersized volume. The character profiles are also very detailed and include every member of the cast, and include interesting previously unknown details, such as the fact that Robico almost made Haru’s cousin Mitsuyoshi an old man. All of these extra features are excellent add-ons at the end. To put it most simply, this volume is an absolute must-have for any fans of My Little Monster. It somehow manages to take what was already an amazing ending and make it better by including developments for a variety of characters, from Sasayan to Takaya. The final chapter’s feature of Shizuku and Haru’s wedding in particular stands out as an excellent reason to buy the book, but basically every page is solid gold for series enthusiasts, including the extra additions added specially for the English release. Overall, this thirteenth volume is an excellent send-off for an amazing series. My Little Monster Vol. 13 was authored by Robico and published by Kodansha Comics USA on March 29, 2016. 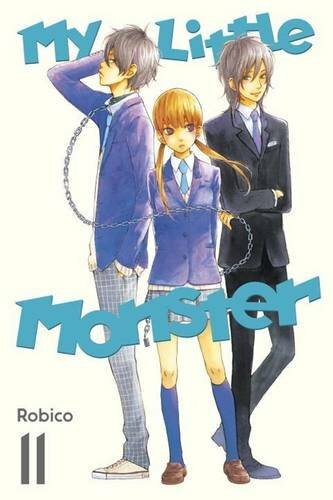 My Little Monster was an ongoing series in Kodansha’s Dessert magazine, and received a single-cour anime adaption by Brain’s Base in Fall 2012. It is was translated by Alethea Nibley and Athena Nibley in English and the series has officially concluded publication in North America.